Simple and classic, the Loon Peak Greenwood Rocking Chair is the perfect choice for a traditional home setting. This rocking chair has an elegant design, which makes it a superb fit into any home. It can be placed anywhere at your home, according to your convenience, to add a touch of comfort and style to any decor. 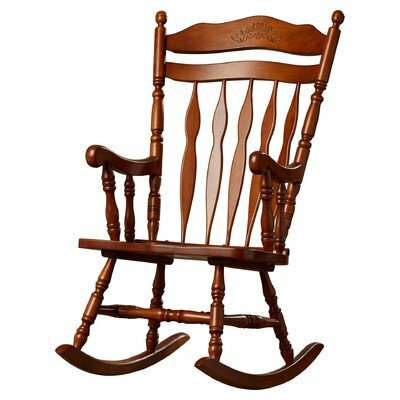 The Greenwood Rocking Chair from Loon Peak is crafted from solid wood for a sturdy and durable frame. The Medium Oak finish gives the chair a polished look that adds to its aesthetic appeal. The wooden rocker runner provides a strong base and offers maximum support to the chair. This rocking chair is useful for infants and nursing mothers, adding an element of relaxation and ease to all those who use it. It can be used outdoors as well, like in the balcony or a covered porch area where you can relax comfortably and read some books while drinking coffee or tea. This rocking chair can blend perfectly with country or cottage home decors. The Loon Peak Greenwood Rocking Chair is easy to maintain and requires minimal assembly. It can be wiped clean with a dry cloth to keep it looking as good as new for years to come. The slats on the back of this item are stationary. If you have any questions about this product by Loon Peak, contact us by completing and submitting the form below. If you are looking for a specif part number, please include it with your message.